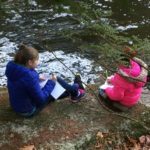 When I take my journal outside (certainly not during black fly season or when mosquitoes are everywhere here in Maine) whether I’m brainstorming ideas, drafting scenes, or writing poems, I find my plein air writing has, for lack of better word, an “airy” quality to it. I’m more open to experimentation. There are no boundaries. 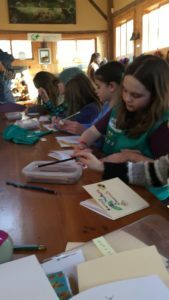 Listen: We began inside the nature center. I shared some of my poems and we talked about some of the poetic techniques I used to write them. Look: Next, with sketchbooks and pencils in hand, we went outside, ready to explore. 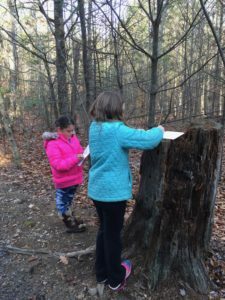 Draw: Whenever something “called” to us from the natural world–it was different for everyone: a rotting tree stump, a gurgling brook, lichen on stone, a woodpecker, tall grasses–we stopped, quickly capturing images and words on the pages of our nature journals. We did this several times in different settings. Write: An hour later, we brought our words and images back inside to help us write and illustrate our poems. What about you? Do you ever write outside? 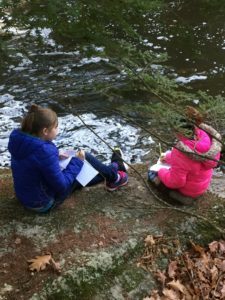 If you work with children, have you ever taken them outside with notebooks? Were you surprised at the results?